In the visual arts circles stand for the sun or the moon. They are halos and wheels of fortune, rings, the earth, compasses or even serpents feeding on their own tail. Circles represent infinity, unity, mobility, repetition and completion. 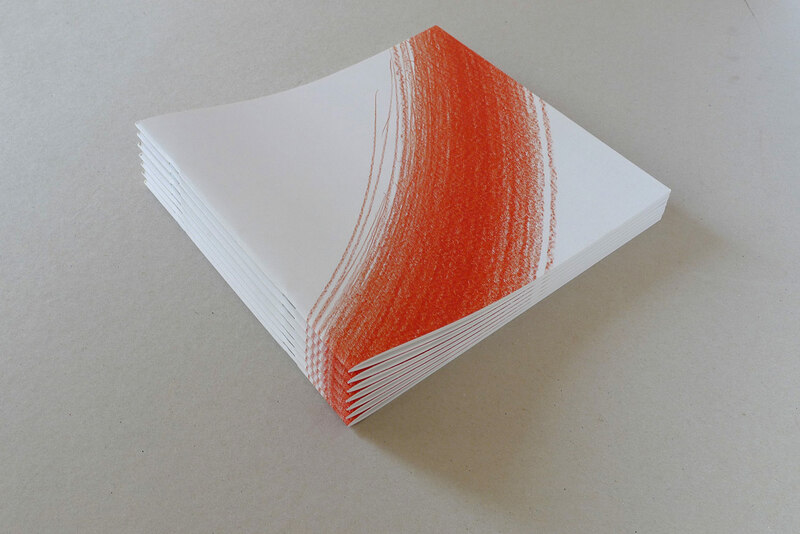 And yet, rather than any of the above, Saskia Wendland’s layered circular repetitions are exercises in perfecting a form, growing into one whole, vibrant, red and round shape. Saskia Wendland draws her circles over an extended time-span of several months, in which they develop into a final shape. They are products of a disciplined, ritualized process. She stands every morning and evening in close proximity to a large paper pinned to the wall and draws one single circle, measuring the full length of her arm. The size of the paper corresponds to her body height. Her whole body engages in the movement. The repetition of this commitment to the same form forces her to start as well as conclude the day as an artist, practicing the difficult task of drawing a simple circle. The way the circles come into being is dependent on her ability to repeat a similar, uninhibited movement time and again. 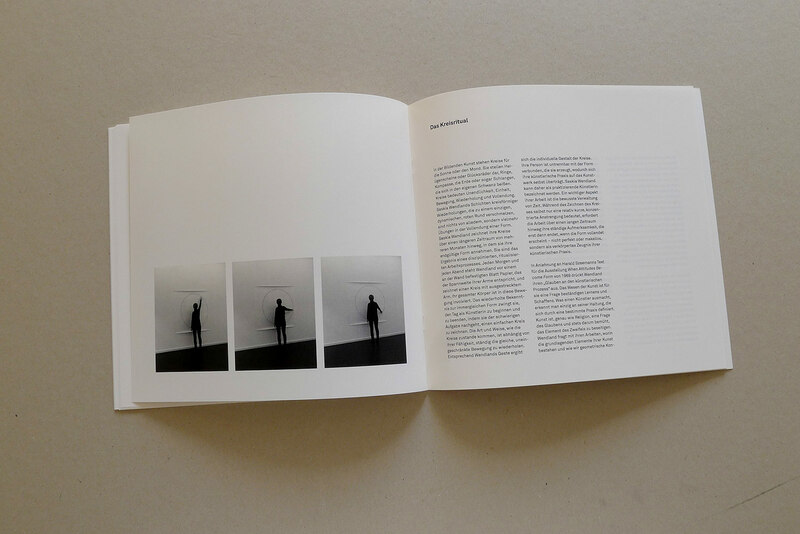 This action personalizes their shape in accordance with Wendland’s gesture. Her persona becomes inseparable from the form she creates and in this way her artistic practice translates into the artwork itself. Wendland can therefore be described as a practitioner of art. An important aspect of her work is the conscious administration of time. While drawing the circle is a relatively short, concentrated effort, the work demands continuous attention over a long period of time concluding only when the form appears to be complete, neither perfect nor immaculate, but a radiating witness to her artistic practice. Referring to Harald Szeemann’s text for the 1969 exhibition When Attitudes Become Form, Wendland expresses “faith in the artistic process.” The nature of art, for her, is a matter of constant learning and doing. There is no other way of defining what an artist is, but to refer to an attitude defined by practice. Art, as religion, is a matter of belief, and its practice is an ongoing endeavours to eliminate the element of doubt. Through her works Wendland asks what constitutes the basic elements of her craft and how we can honour and find meaning in geometric constructions in and of themselves, without attaching a translatable iconography, symbolism or narrative to them. In languages that emphasize the importance of letters as images, such as Chinese and Japanese, but also Hebrew and Arabic, each character is valued independently as a picture and as a carrier of meaning. Correspondingly, Wendland’s circles can be referred to as a letter in her artistic language and as an inherently significant form. The continual return to the same form—also evident in other works, such as the circle drawings made from many points or the images of geometric grids that fold into circular voids—demands further analysis. Wendland lived in Japan and studied calligraphy from 2001 to 2003. This experience left a deep impression on her attitude towards art. Although she began the series of circle drawings before her departure for Japan, her ritualized discipline came together only after her return. Wendland’s circles reference an “Enso”, the Zen Buddhist circle, a ring that is hand-drawn with a brush and ink on paper in expression of the moment when the mind is free and the body can create. The “Enso” can be a closed or open circle, representing the beauty of imperfection. Wendland remains faithful to the ascetic void in the middle of the “Enso” and to the act of drawing. Instead of displaying the outcome of one particular moment of creation, Wendland repeats the creative act twice daily, layering the circles in the form of a visual diary, and using a colored pencil with discernible thick lines, rather than ink. Her circles, though closed in the final appearance, are built out of layers of circles that may be open or closed, depending on the way her arm leads her. Wendland practices, studies and develops her expertise and faith in the creation of form, finding meaning in the process and in the emergence of the artwork as a documentary of that process.